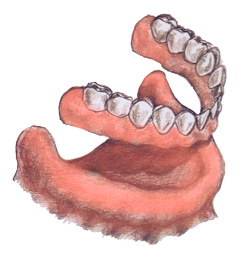 One alternative to a fixed bridge is a removable overdenture, which is anchored on implants. 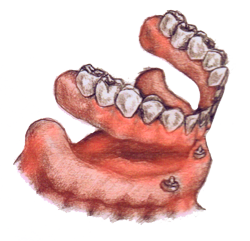 The “old-fashioned” denture has many disadvantages and should be avoid, if possible. 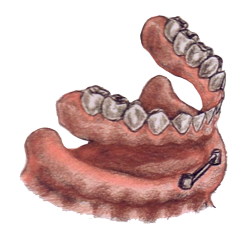 This is a removable full denture that is connected to either a ball or bar attachment, which in turn is anchored on two or more implants in the front part of the jaw. This is a denture that is loosely placed on top of the gum to cover lost teeth. The main advantages are low price and easy installation. Unfortunately, the disadvantages are many and varied: discomfort while eating, poor aesthetics, sore gums, and speech is affected. A full denture placed in the upper jaw also affects the sense of taste.